This hymn is generally considered to be one of the best-loved hymns written during the latter part of the nineteenth century. The writing of this thoughtful and artistically constructed text is even more remarkable when it is remembered that it was authored by one who was totally blind and who describes the writing as the "fruit of much menial suffering." Born in Glasgow, Scotland, March 27, 1842, George Matheson had only partial vision as a boy. After he entered Glasgow University, his sight failed rapidly and he became totally blind at the age of eighteen. Despite this handicap he was a brilliant scholar and finished the University and the Seminary of the Church of Scotland with high honors. In 1886 he became pastor of the 2,000 member St. Bernard's Parish Church in Edinburgh. He went on to become known as one of Scotland's out¬standing preachers and pastors, greatly esteemed in Edinburgh, where his eloquent preaching consistently attracted large crowds, Matheson never married, but throughout his fruitful ministry he was aided by a devoted sister, who herself learned Greek, Latin, and Hebrew in order to aid him in his theological studies. She was his faithful co-worker and helper throughout his life, assisting in his calling and other pastoral duties. "My hymn was composed in the manse of Innellan on the evening of the 6th of June, 1882. I was at that time alone. It was the day of my sister's marriage, and the rest of the family were staying overnight in Glasgow -Something happened to me, which was known only to myself, and which caused me the most severe mental suffering. The hymn was the fruit of that suffering. It was the quickest bit of work I ever did in my life, I had the impression rather of having it dictated to me by some inward voice than of working it out myself. I am quite sure that the whole work was completed in five minutes, and equally sure it never received at my hands any retouching or correction. I have no natural gift of rhythm. All the other verses I have ever written are manufactured articles; this came like a dayspring from on high. I have never been able to gain once more the same fervor in verse." The hymn first appeared in the Church of Scotland monthly magazine, Life and Work. m January. 1883. The tune was composed one year later by a prominent Scotch organist of his day, Albert L. Peace, who was requested by the Scottish Hymnal Committee to write a tune especially for Matheson's text. Peace's own account of the writing of this fine tune is as follows. "After reading it over carefully, I wrote the music straight off, and may say that the ink of the first note was hardly dry when I had finished the tune." The significance of the tune name, "St. Margaret," is unknown except that it is a name greatly revered in Scotland, no doubt because of the beloved Queen Margaret, who was canonized in 1251. The later years of Matheson's life were spent in writing some of the finest devotional literature in the English language, including Moments on the Mount. Voice of the Spirit, and Rests by the River. 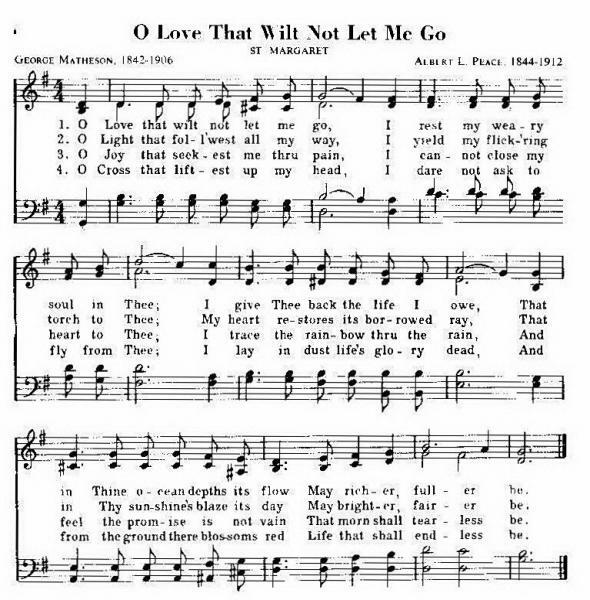 Although this is his only hymn found in most evangelical hymnals, Matheson did write a number of other fine hymns, including a thoughtful text entitled "Make Me a Captive Lord, and Then I Shall Be Free." The four key words or symbols of "0 Love, That Wilt Not Let Me Go" are Love, Light, Joy, Cross. These words have been described as the total fulfillment for any believer whose life is totally committed to the will of God. One could probe for considerable time the depth and personal significance of these four expressions.